Now that the midterms are finally over, the battle against “Medicare for All” that has been quietly waged throughout the year is poised to take center stage. 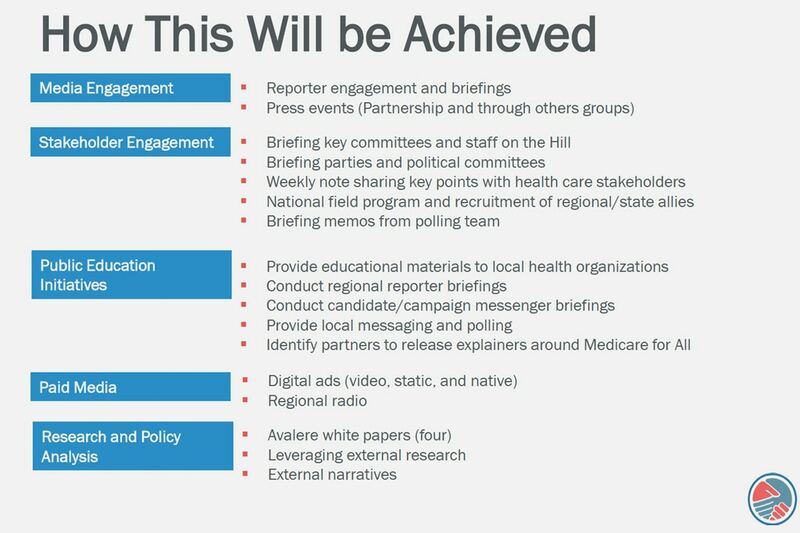 Internal strategy documents obtained by The Intercept and Documented reveal the strategy that private health care interests plan to use to influence Democratic Party messaging and stymie the momentum toward achieving universal health care coverage. At least 48 incoming freshman lawmakers campaigned on enacting “Medicare for All” or similar efforts to expand access to Medicare. And over the last year, 123 incumbent House Democrats co-sponsored “Medicare for All” legislation — double the number who supported the same bill during the previous legislative session. The growing popularity of “Medicare for All” in the House has made progressives optimistic that the Democratic Party will embrace ideas to expand government coverage options with minimal out-of-pocket costs for patients going into the 2020 election. But industry groups have watched the development with growing concern. Over the summer, leading pharmaceutical, insurance, and hospital lobbyists formed the Partnership for America’s Health Care Future, an ad hoc alliance of private health interests, to curb support for expanding Medicare. Behind the scenes, the group attempted to sway candidates during the midterms, encouraging several of them to focus on shoring up the Affordable Care Act instead of supporting single-payer health care. Several of the candidates who agreed to embrace the Partnership’s messaging and policy ideas, including Donnelly and O’Connor, came up short on Election Day. A recount ending on November 18 confirmed that Nelson received fewer votes than Republican challenger Rick Scott. But soon after Election Day results came in, the Partnership went on the offensive, informing reporters that candidates who embraced “Medicare for All” had also lost, pointing to the defeat of progressives such as Kara Eastman in Nebraska. The group also relied on research from the business-friendly Democratic think tank Third Way to argue that victorious pro-“Medicare for All” candidates couldn’t attribute their success to having supported “Medicare for All” because few Democrats explicitly mentioned the policy in their campaign advertisements. “’Medicare for All’ didn’t win,” said Joel Kopperud, the vice president of government affairs at the Council of Insurance Agents and Brokers, one of the industry groups backing the Partnership. “I don’t think that the Bernie Sanders $32 trillion solution that’s going to eviscerate the insurance for 156 million Americans is really something that’s going to be helpful to the party in critical states,” he added in an interview with The Intercept. Kopperud represents insurance brokers who sell employer-based health insurance coverage. He noted that his organization has a vested interest in backing the Partnership. “Medicare for All,” as some envision the policy, would eventually eliminate the need for most health insurance plans — a death knell for companies represented by the CIAB. Private health care lobbyists are confident that they can prevent any federal expansion of Medicare in Congress, given Republican control of the Senate and the White House. In the states, CIAB and other private health groups have easily defeated measures to develop single-payer proposals, such as the ColoradoCare ballot question in 2016. But the political calculus could be changing. Recent election gains by Democrats in state government could create new opportunities for proponents of expanded government-backed health care initiatives. Gov.-elect Gavin Newsom of California campaigned on single payer and is expected to have one of the largest Democratic supermajorities in recent memory in the legislature, though California has a notoriously complex state constitution that would likely require an amendment before any significant government plan could be created. The growing momentum for “Medicare for All” could raise expectations for the next time Democrats are in full control of power in Washington, industry groups worry. They are already pressuring conservative-leaning caucuses in the House of Representatives, such as the Blue Dogs and New Democrats Coalition, to push back against insurgent progressives’ demands. For industry opponents of expanded government health insurance, there are two main challenges. One is combatting growing public support for the idea. The other is shaping elite opinion within the Beltway. Over the last two years, several opinion surveys show rising support for expanding Medicare. In March, the Kaiser Health Tracking Poll found that 59 percent of Americans support the idea, and by August, a poll conducted by Reuters-Ipsos found an astounding 70 percent of Americans support “Medicare for All,” including a majority of self-identified Republicans. But the Partnership is quick to zero in on research that shows support for the idea drops precipitously when respondents are told that the plan would require ending employer-based coverage, tax increases, and increased government control. The campaign has worked with advertising agencies to draw up a series of messages to convince select audiences. Several of the messages, categorized as “positive,” are dedicated to educating the public on more minimal reforms that do not include expanding Medicare. 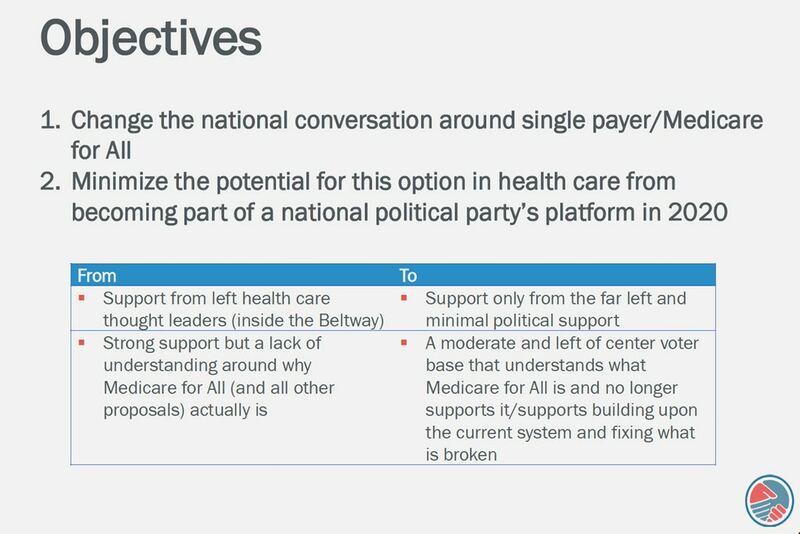 Other messages, categorized as “persuasion” and “aggressive,” are designed to instill fear about what could happen if “Medicare for All” passes. 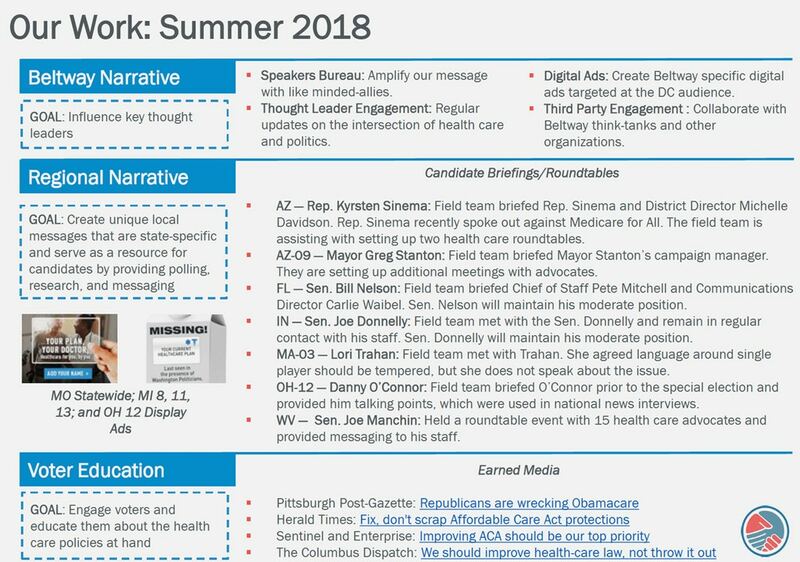 In the coming weeks, the Partnership plans to ramp up a campaign designed to derail support for “Medicare for All.” The group, working with leading Democratic political consultants, will place issue advertisements to target audiences, partner with Beltway think tanks to release studies to raise concerns with the plan, and work to shape the public discourse through targeted advocacy in key congressional districts. The Partnership has tapped consulting firms with deep ties to Democratic officials. Forbes-Tate, a lobbying firm founded by former officials in President Bill Clinton’s administration and conservative Democrats in Congress, is managing part of the Partnership coalition. Blue Engine Message & Media, a firm founded by former campaign aides to President Barack Obama, has handled the Partnership’s interactions with the media. The Partnership plans to form a speakers bureau of former Democratic elected officials who can leverage the media to make the case that expanding Medicare is bad politics and policy. The memo names former Democratic Majority Leader Tom Daschle, now a health insurance lobbyist at the law firm Baker Donelson, as one such potential surrogate. The memo points to early success in shaping media coverage, citing several “earned media” columns such as one published in August by former Rep. Jill Long Thompson, D-Ind., which argues that Democrats should only focus on small reforms to the Affordable Care Act, and warns against wasting political capital on pursuing a “government-controlled health insurance system.” Thompson, now an associate professor at Indiana University Bloomington, did not respond to a request for comment. Adam Gaffney, president-elect of Physicians for a National Health Program, a national coalition that advocates in favor of “Medicare for All,” said he is not surprised by the messaging. “What we’re seeing is the wages of success: With single payer on the rise, it was only a matter of time before the insurance companies, big pharma, and other big-money groups came out swinging,” said Gaffney, who also serves as an instructor at Harvard Medical School. “The smear of ‘socialized medicine’ has been used a thousand times and has lost its bite,” he added. “We’re all focused on 2020,” Lauren Crawford Shaver, a partner at Forbes-Tate who is helping to manage the Partnership campaign, recently told the National Association of Health Underwriters in a podcast produced by the group. Shaver, a former top staffer for the Hillary Clinton presidential campaign, explained to the group that she is working to peel support away from the “Medicare for All” bill sponsored by Sen. Bernie Sanders, I-Vt. The Sanders bill is currently sponsored by several rumored 2020 Democratic presidential candidates, including Sens. Elizabeth Warren, D-Mass. ; Kamala Harris, D-Calif.; and Kirsten Gillibrand, D-N.Y.
Shaver encouraged health care companies concerned about the growing popularity of “Medicare for All” to mobilize opposition among clients, customers, and employees. Industry groups will likely have workers or customers residing in key districts who can be tapped to influence wavering lawmakers on Capitol Hill. The Partnership plans to “take stories of how these proposals would directly impact your clients and the constituents of the policymakers who are voting for or against these proposals,” Shaver said. The Partnership strategy echoes the health insurance industry’s campaign to shape the 2008 presidential primary. At that time, the health insurance lobby group known as America’s Health Insurance Plans, or AHIP, tapped the consulting firm APCO to develop an effort to label any government-run insurance option as an existential threat to Democratic political goals. The initiative emerged from a plan to minimize the impact of Michael Moore’s documentary “Sicko,” which was deeply critical of the American health care system. Now, the same lobby groups are involved in a similar effort. AHIP, the insurance trade group behind the 2008 plan, is also a sponsor of the Partnership’s 2020 campaign, along with the Federation of American Hospitals, Pharmaceutical Research and Manufacturers of America, the Blue Cross Blue Shield Association, the Biotechnology Innovation Organization, and the American Medical Association. Not only are the same health insurance groups financing a renewed campaign against “Medicare for All,” but many of the same players who worked to undermine the public option during the ACA debate are now fighting for influence within the party. The public option was the government-run insurance plan that advocates intended to use to compete with private insurance and bring down consumer costs. In one version of the plan, the public option would pay doctors and other providers the same reimbursement rates as Medicare. Despite a pledge by many Democratic candidates to eschew corporate PAC donations, health care lobbyists have funneled cash to many incoming lawmakers through the New Democrats PAC, the Blue Dog PAC, and other centrist committees. Unsurprisingly, the centrist New Democrats Coalition, the caucus of business-friendly centrist Democrats, has worked to depress momentum for “Medicare for All,” reprising the role centrist Democrats played in killing the public option during the Obama administration. In 2009, then-Sen. Joe Lieberman, I-Conn., a founding member of the New Democrats caucus, threatened to join the Republican filibuster against health reform unless the public option was dropped from the bill. Immediately following the midterm elections this month, the Washington Post published a column by Third Way warning that “Medicare for All” “failed the Hippocratic Oath” because opposition to the plan helped Republican candidates, thus causing “harm” to the long-term health interests of voters. But advocates for “Medicare for All” are feeling optimistic. Private health care interests will certainly have much more money, media attention, and political resources with which to campaign. Advocates, however, are hoping Americans see past the public relations smokescreen and support health care as a human right. “There is no brand loyalty to insurance companies, which are rightly seen as parasitic,” Gaffney, the PNHP leader, said. “Once single payer is widely understood as a program that covers everyone, that doesn’t impose copays and deductibles, that has more comprehensive benefits than existing plans, and that doesn’t employ restrictive insurance ‘networks,’ support will only grow,” he added.